Photo courtesy of Jamie Matthews. One order to “go”, please. John, this is the place. I suppose they’re flushed with success. First toilet I’ve seen with glass doors! The only restaurant in China where you can get sh*t on a shingle. Surprisingly enough this is not really Engrish. 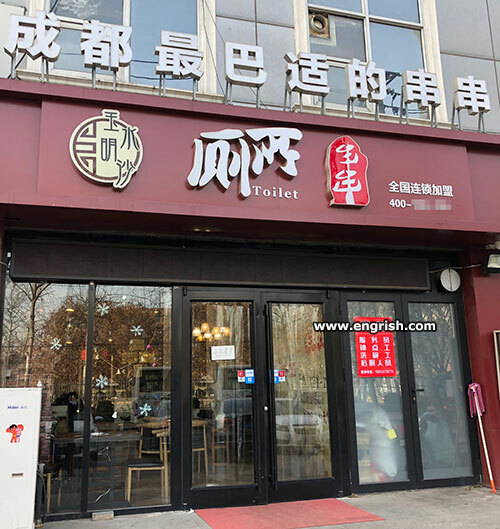 The restaurant really is called 厕所串串香 or “Toilet String Fragrance,” where the latter is the name of a famous Sichuan dish. Apparently the restaurant got this nickname because it is situated next to a public toilet and people kept referring to it as such, and eventually they just adopted it as the official name. Yep, I think I see some stools along the counter. Before you eat of our: “Japanese Puffer Fish Surprise” . We suggest you kiss your ar$3 goodbye. When I went to Britain in 1999, the Harrod’s department store charged a pound to use their toilet. I didn’t go in though. Who ordered the pu pu platter? @DrLex: Toilet string? Chinese toilets must be stranger than I can imagine! Reminds me of the old piece of graffiti: “All turds over 10 lbs must be lowered by rope”. @Long Tom | 8:36 am: At least they weren’t charging by the pound! Please pass the toilet pepper. This place is flushed with success. Customer: May I have a toilet bowl of Sichuan Noodle please? Server: Large, Medium, or small? Customer: Whichever fits my arse! Did Engrish get locked in the toilet lately? How’d I wind up in the wrong place? A toilet, um . . . spring roll, please!